Social media has emerged as a valuable and effective fundraising tool for terrorist groups. The Internet's easy access and relative anonymity allows terrorist groups to solicit online donations from both supporters and unsuspecting donors who believe they are supporting a humanitarian or charitable activity. 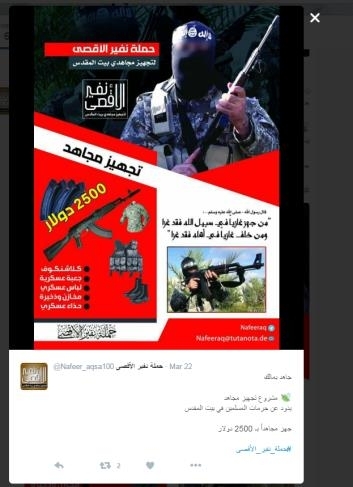 On March 22, for example, the Nafir al Aqsa (Mobilizing for Al-Aqsa) Campaign "to equip the mujahidin of Beit al Maqdis [Jerusalem]," posted (and suspended in the past day) a solicitation for funding under the Twitter handle @Nafeer_aqsa100. It cites a hadith – a saying attributed to Islam's prophet Muhammad – that giving money to those waging jihad is as good as doing it yourself. The Messenger of God (May God bless him and grant him peace) said: "Whoever equips a warrior in the way of God has himself fought, and he who supplies the needs of the family of a warrior has himself fought." The post lists a Telegram account "Nafeeraq" and email Nafeeraq@tutanota.de to contact the campaign. 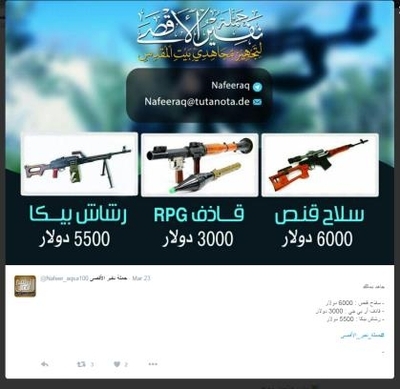 Another post from March 23 (also suspended in the past day) solicits funds for jihad, listing the prices of a sniper weapon ($6,000), a grenade thrower RPG ($3,000), and PK machine gun ($5,500). The solicitation campaign cites a statement from bin Laden: "I urge the youth and the sincere traders to seize this opportunity and undertake this sublime task of defending this religion and salvage this Ummah by supporting this Jihad and their properties and by exhorting and fighting against our enemies, especially in Palestine and Iraq." The Nafir al Aqsa campaign also solicits funds on YouTube. 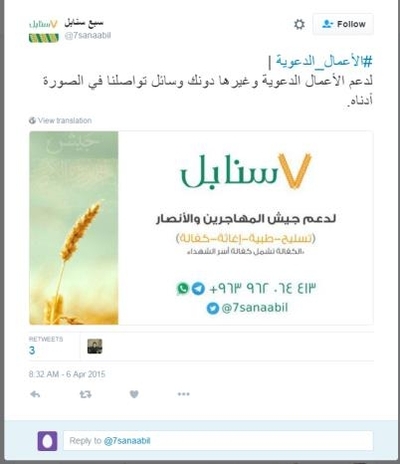 In an April 2015 post, the Twitter handle @7sanaabil belonging to a Chechen jihadist group Jaish alMuhajireen wal-Ansar ("The Army of the Mujahidin and Ansar") based in Aleppo, Syria, solicited donations for "Arming-Medical-Relief-Sponsorship" and "sponsorship of the families of martyrs." The fundraising campaign uses Whatsapp and Telegram – mobile apps to receive and send text messages – to communicate instructions for transferring money. Jaish alMuhajireen wal-Ansar has pledged allegiance to al-Qaida's Syria branch, the al Nusra Front. An Aug. 21 post by @7sanaabil claims that "Jihad for money" trumps the interpretation of jihad in the Quran as a struggle for self improvement. A recent report by the Paris-based Financial Action Task Force (FATF), an intergovernmental money laundering and terrorism financing watchdog, underscores the widespread use of social media platforms such as Facebook, Twitter, YouTube, Whatsapp, Skype, and Telegram by terrorist groups and their financial facilitators to coordinate "large-scale and well-organized fundraising schemes" involving thousands of "sponsors" raising "significant amounts of cash." The challenge in slowing online fundraising "in an era when social media allows anyone with an Internet connection to set himself up as an international terrorist financier" was further highlighted by then-Under Secretary for Terrorism and Financial Intelligence and now CIA Deputy Director David Cohen in a March 2014 address before the Center for New American Security: "We see this activity most prominently in Kuwait and Qatar, where fundraisers aggressively solicit donations online from supporters in other countries, notably Saudi Arabia, which have banned unauthorized fundraising campaigns for Syria." A fundraising campaign tied to the al Nusra Front and led by Saudi Sheikh Abdullah Mhesne used the Twitter handle "Jhad_bmalk" to call for contributions "to support the Islamic battalions" by invoking passage 47:38 from the Quran: "Behold, you are those invited to spend in the way of Allah; but among you are some that are niggardly. But any who are niggardly are so at the expense of their own souls." The now-suspended Twitter campaign openly acknowledged that contributions would help buy weapons by listing the price of 8 mortar shells as "100 Kuwaiti Dinars" or "1,300 Saudi Riyal, Qatari Riyal" and the "150 Kalashnikov bullets, 50 sniper bullets" as "50 Kuwaiti Dinars" and "650 Saudi Riyal, Qatari Riyal." It then assigns "gold" and "silver" "shares of the project" based on the individual's contribution and states, "Choose, my brother, how many share in the Way of God you want." The tweet included Kuwaiti and Qatari Whatsapp numbers to contact to make a donation. Shutting down social media pages soliciting for terrorists is more challenging than one might expect. Often, groups recreate accounts under new names to replace those shut down. In November 2014, for example, the Middle East Media Research Institute (MEMRI) reported on the "Madad Gaza Twitter Campaign" launched the previous month by the military wing of the Palestinian Popular Resistance Committees in the Gaza Strip. 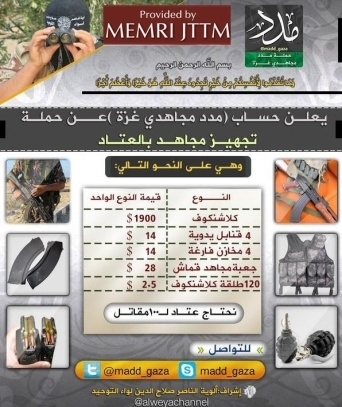 The fundraising drive boldly listed prices of weapons and other equipment that could be purchased by donations to the "Mujahideen of Gaza": "Kalashnikov (AK-47 assault rifle)--$1900, four hand grenades – $14, four empty ammunition clips – $14, 120 bullets for a Kalashnikov – $2.5," the post reads. It also lists ways to contact the group. 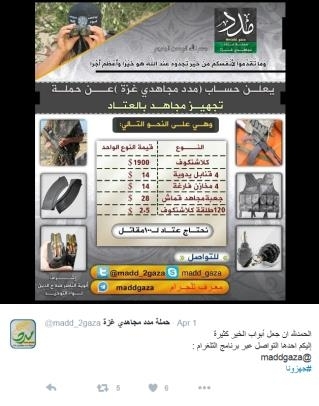 The account was suspended but the same fundraising campaign appeared under a new avatar in an April 1 post. 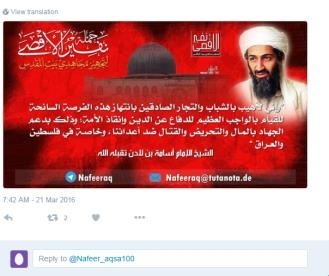 MEMRI also reported on the Nafir Al-Aqsa ("Mobilizing for Al-Aqsa") campaign that was launched on Twitter (@nafeeraq) in November 2014 by Gaza jihadis to raise money to "repel the Jews' aggression and liberate Al-Aqsa Mosque" and is "associated with pro-Islamic State (ISIS) elements in Gaza." The account was suspended but resurfaced under a new Twitter handle @Nafeer_aqsa100 that published its first post on Feb. 5. 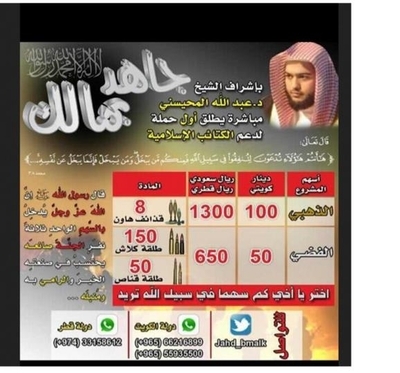 A March 26 post (since suspended) asks supporters to "Participate in bombing in usurped places and Jewish cities by paying the cost of the rocket for the Mujahideen [Holy Warrior]." 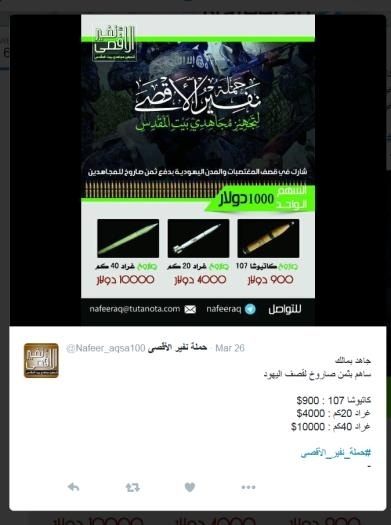 It asks Muslims to donate "$900 to buy Katyusha 107 rocket, $4000 to buy 20 km Grad Rocket, an 10000 to buy 40 km Grad rocket." In August 2014, the U.S. Treasury Department designated three key terrorist financiers for moving "money, arms, and fighters" to the Syria-based al-Qaida-affiliated al Nusra Front and the Islamic State "through fundraising appeals on social media and the use of financial networks." Two of the three, Hajjaj Al-Ajmi and Shafi Al-Ajmi, both Kuwait-based terrorist financiers, "resumed their tweets using two new accounts after their original accounts were banned," according to a report in the Kuwait Times. "We will continue supporting Islam and its people, and praise will be to Allah always," Hajjal al-Ajmi wrote in his first tweet following the designation. "And only believers believe all what happens to them is for their own good." A popular method to raise money online by Islamic State militants from Russia's North Caucasus region was the QIWI wallet electronic payment system. The fundraising campaign was led by the Russian-language ISIS media activist group, ShamToday. ShamToday used VKontakte, often described as "Russia's Facebook," to solicit donations. The QIWI wallet allows individuals to donate money without requiring them to share their bank account information or even owning an account. According to a Radio Free Europe report, "IS sympathizers who want to donate to ShamToday can do so at a dedicated QIWI kiosk (Russia had over 169,000 of these in 2013) or via their smartphone, by transferring money from their own QIWI account to the ShamToday account number, provided by the group on its donation request." An advertisement posted on VKontakte by ShamToday appeals for donations using the QIWI wallet system. The solicitation reportedly cites a Quranic verse that direct Muslims to "fight against the disbelievers collectively as they fight against you collectively." The account was suspended following an order by the Russian prosecutor-general in October 2014. Financial facilitators who fundraise for terrorism using social media often do so under the guise of soliciting donations for legitimate charitable and humanitarian activities. In November 2014, a French charity that called itself "Pearl of Hope" was shut down after two of its senior leaders were charged with financing terrorism in Syria. The charity's solicitations reportedly "featured poignant images of wounded children and calls for donations to promote the health and education of sick Syrian and Palestinian toddlers." Although Pearl of Hope posts on Facebook and YouTube show that it did indeed transport food and medical supplies in Syria, investigators say the charity also used "such deliveries as a front to funnel covert funds to jihadist groups and had links to the Syrian al-Nusra Front." Terrorist groups have also been known to use crowdfunding websites to raise money by setting up a fundraising page ostensibly for charitable and humanitarian activities while collecting donations to bankroll their jihadi activities. "Terrorism financing continues to manifest itself in so many different ways with more recent developments coming in the form of the use of largely unregulated space of social media by terrorist groups such as ISIL [Islamic State of Syria and the Levant] for crowdfunding," Paul Jevtovic, head of Australia's financial intelligence unit, AUSTRAC (Australian Transaction Reports and Analysis Centre), said during a November regional security summit in Sydney. In testimony before Canada's Standing Committee on National Security and Defense, Michael Peirce, a senior official with the Canadian Security Intelligence Service (CSIS), also highlighted the use of crowdfunding websites by terrorists to raise funds. "The Internet age has given us the ability for people to go and put a public message seeking funds. 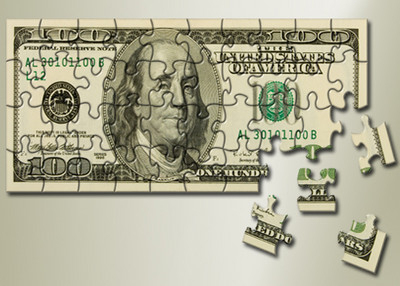 They won't necessarily direct the full purpose of raising the funds. Again, they might do it under the cover of humanitarian aid, but crowd share. 'I want to go carry out humanitarian aid in Somalia, please share funds,' and they set up a website, and funding flows through. It's quite a troubling development from the Internet." FATF's 2015 report mentions a case study where ISIS supporters asked donors to contact them via Skype. Donors who reached out were told to buy an international prepaid card and send the prepaid card number to them via Skype. The fundraiser then sent the card number to a contact living in a country neighboring Syria who would then sell the card number at a lower price and provide the cash earnings to the terrorist group.